We've spent this morning having a coffee with Siri, and she gave us a few hints at what to expect this evening at the iPhone 6S event. We expected her to have some insider information, as the virtual assitant is set to be a big focus of the iPhone 6S launch later today, or that's at least what the Apple invite for the event suggests. The poster reads, “Hey Siri, give us a hint” and when we asked her that before she just directed us toward the September 9 launch date and didn't share any extra info. It's still much the same now, but there are a few new answers out of our iPhone assistant – rumour is the virtual assistant will be always-on inside the new iPhone 6S. Here's every answer she gave us when we asked, “Hey Siri, give us a hint?”. The first hint almost fell for our questioning, but then stopped at the last moment. Siri also clearly got its days mixed up thinking the announcement was tomorrow.Then we asked again and we got a binary code message – we translated it and it came out as “gotcha”…godammit Apple. 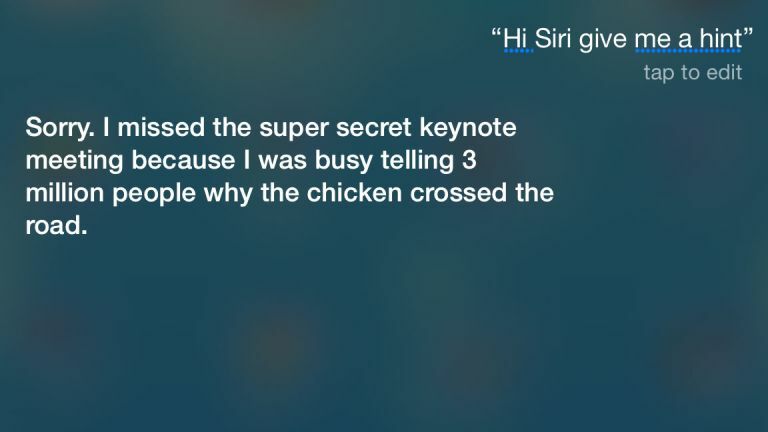 Siri's next message referenced the three million people a year who ask Siri why the chicken crossed the road. The next version, showed Siri's sassy side giving us a tip even better than not eating yellow snow. Siri then tried to send us details of the iPhone 6S in a different way – maybe there's some new telepathic connectivity on the new phone? The last version suggests Siri knows something more about the wider universe than we do. Either that or it's some kind of Star Trek reference that has gone compeletely over our heads.